9ct yellow gold drop earrings featuring quarter carat diamonds in a twist design. An elegant gift for a special occasion. 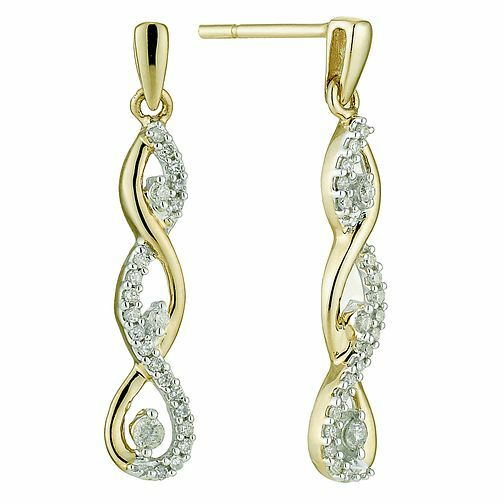 9ct yellow gold 0.25ct diamond twist drop earrings is rated 5.0 out of 5 by 3. Rated 5 out of 5 by Anonymous from Beautiful Earrings I arranged to collect the 9ct yellow gold drop earrings featuring quarter carat diamonds in a twist design from the Chichester Branch of Ernest Jones and they looked even better than on the Web Page and this surprised me. Cant wait for the Wife to open the Christmas present. She will love them I am sure. Rated 5 out of 5 by Anonymous from Extremely pretty These earrings are heavier than they look, but do not feel heavy when wearing them. They are absolutely beautiful and look much better in real life that the photo! The photo does them no justice at all. I have had several comments about how pretty they are even from people who usually make no comments!